This past weekend around 50 000 people from around Germany protested in Berlin against nuclear energy. The demonstrators protested against threats from the current right wing government to extend a deadline for the countryâ€™s 17 nuclear reactors. â€œIn Berlin an estimated 50,000 people have joined a demonstration against nuclear power in the run-up to the German general elections. Back in 2001 the former Social Democratic chancellor, backed up by the Greens, pushed through a new legislation in 2001 that would phase out nuclear energy from Germany within two decades. But the Social Democratic and Green government lost the election in 2005 to a right-wing coalition consisting of the current Chancellor Angela Merkel's center-right Christian Democrats and the liberal Free Democrats. "But in the long term, that's to say in the second half of the century, we will experience a large amount of renewable energy sources. We are convinced that we will be able to stop using nuclear energy at some pointâ€, Merkel said. The Social Democratic chancellor candidate, Frank-Walter Steinmeier, is accusing Angela Merkel's center-right Christian Democrats and the liberal Free Democrats "of leading the country into an energy policy dead-end and endangering domestic security." 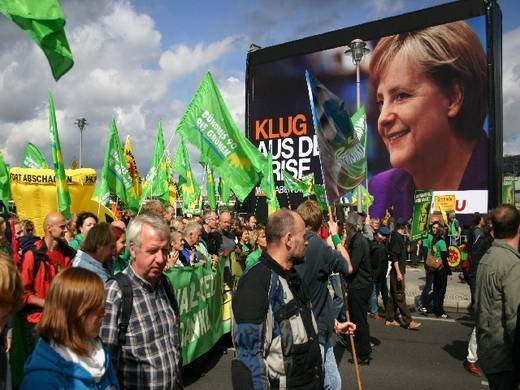 On the same day as the anti-nuclear protest in Germany were taking place Greenpeace released a survey which found that 59% of Germans are against Merkel's proposal to extend the deadline for the countryâ€™s already aging nuclear reactors. at a speech the Brandenburg Gate. Nils Diedrich, a political scientist at Berlin's Free University, says that if Merkel and her right wing coalition manage to push through this pro-nuclear legislation â€œwe'll see a real battleâ€. He warns that â€œthen there will be massive demonstrations." Although Germany is one of the leading countries in renewable wind energy it still has a dirty and toxic energy portfolio. 42% of the countryâ€™s energy comes from coal and 23% from nuclear energy. Only about 15% of the energy comes from clean renewable energy sources such as wind and solar. Nuclear energy, especially in its current state, is underdeveloped when taking the environment into account. Solar energy is the way to go. For more info regarding solar energy, have a look at this Green Journal. There is something that critical thinkers should know about Gerhard Schroeder, the Social Democratic chancellor who negotiated the deal to shut down Germany's 17 emission free nuclear power plants well before the end of their useful life. The gas that the pipeline will carry will be used as part of the replacement power generation capacity. So will the biofuels produced by the farmers who led the protests in Berlin. Both gas and biofuels would have a smaller market at a lower price if the nuclear plants were kept in service. The dispute is not just about illogical fear of the potential consequences of a nuclear plant accident, it is also about a logical - if slightly immoral - desire to make money by selling goods that would not be needed if the useful plants were not prematurely removed from service. People motivated by greed are apparently is winning the hearts and minds of Germans, even though the result will be that they will pay higher prices for dirtier electricity than they would if the plants kept running. "Within one month after he lost in his reelection bid to Ms. Merkel, he accepted a high level position with Gazprom, the Russian natural gas monopoly, with the responsibility of directing the completion of a gas pipeline under the Baltic Sea directly from Russia to Germany." Yes you are correct. And in my opinion that is morally wrong. But that doesn't take away the fact that Nuclear energy is Expensive, Dangerous, Not Cost-Effective and Will Worsen Climate Change. Simply put: nuclear power is not the answer to our energy and climate crisis. Simon - the facts do not back up your assertions. Even your links are to documents that talk about the cost of future plants - which is a topic ripe for endless discussion because no one knows how much they might cost. That a debate topic where anyone is allowed to assert almost anything, after all, it is about the future. These costs come from actual accounting data on real plants. They are not figments of someone's imagination or predictions of the future. My reason for introducing Schroeder's betrayal into the discussion is that it should cause one to question why he was so adamant about shutting down those already constructed plants. Causing a market demand for Russian natural gas at a time when he might have been negotiating in private for a lucrative private position after "serving" as Chancellor just might be a logical explanation for his actions, especially when you find out just how greedy he was for personal wealth and status symbols. Say what you will about future nuclear plants; it is hard to assert that the existing ones are expensive to run or cause greenhouse gas emission. Heck, there are some places where governments have threatened to slap a windfall profits tax on nuclear electricity generators because they are so profitable when selling electricity in a competitive market whose price is set by natural gas or in a market where coal plants have to purchase emissions credits. One correction: Actually the Social Democratic Party still shares power with Angela Merkel's conservative party. So there is no conservative coalition in Germany. I am afraid that there will be after the elections on 9/27. Interesting posting. Thanks for the info. Keep up the good work.